Well, last time I wrote my blog on the fly on my iPad. I had just finished packing up and leaving from Great Western War in Bakersfield, CA, and I was totally psyched about the very cool, and very hot, activities that I had participated in. It was the sort of experience that makes you genuinely excited about your craft and reminds you why you got involved in all of this in the first place. Thanks to the miracle of the internet I now have more information to share about the people and things that were going on. The bead furnace at GWW was made by Thea Northernridge, Maeve Douglass, and crew, from the Kingdom of Caid. I have seen several bead furnaces over the years, most courtesy of Keeley the Tinker (Kingdom of the Midrealm), who has been researching and experimenting with pre-1600 glass bead furnaces for a considerable number of years. The GWW bead furnace is based on Keeley’s work and the plans that she made available to the group. The plans produce a furnace that can be completed quickly and used quickly. While not completely period it gives the impression of a period furnace, and it does work well enough to allow people to make beads. Not all experimental furnaces actually function. I am not using any formal titles for any of the folks who are involved with this project. Several people have several titles, some people’s titles that have changed since older documents were published, and to be honest, my goal is to give as much credit as I can to the folks who did the work. I have several titles and names. My favorite one to answer to? Eirny. 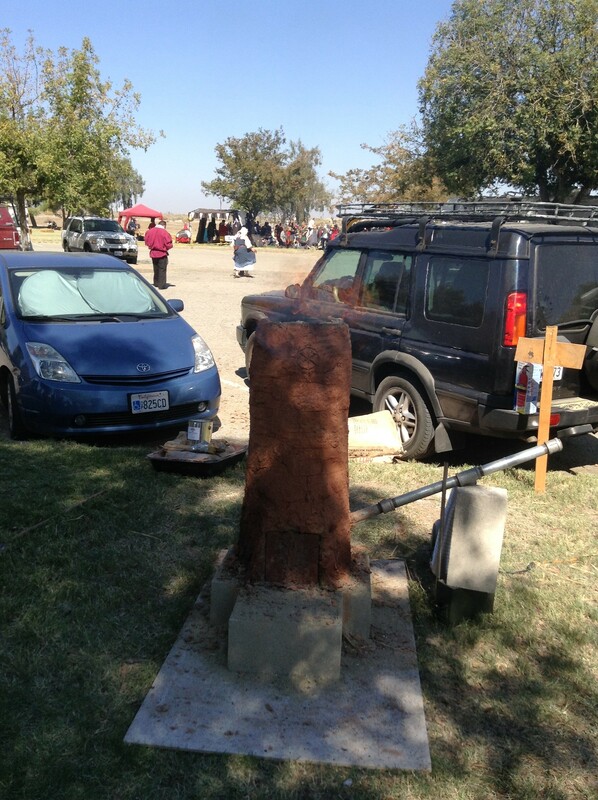 Like many things that happen at events, this bead furnace project became a cooperative project. Through a series of mishaps people who had planned to help could not attend, but another group, who were planning to build an iron-smelting furnace, pitched in. And the rest is history. A pseudo-historic bead furnace and an iron smelting furnace were both built down at the end of merchants’ row, right next to the blacksmith shop. Great piles of red clay and charcoal became baked receptacles for glass and iron ore. And to be blunt, it was just plain exciting. I stopped by as often as I could to watch the progress of the construction and firing of the bead furnace and the smelting furnace. Great lengths were taken to make sure that water and fire extinguishers were at hand and that everyone was safe. Here is a picture of the iron smelting furnace, complete with some fire. I realize that not everyone has seen a bead furnace in person, and many people may not have even seen glass beads being made. I went in search of a good video that would show how Viking style glass bead furnaces actually work. This is probably one of my favorite videos about ancient glass beadmaking. It shows the building of the furnace, the firing of the furnace, and then the furnace being used to make glass beads. The video was made at the Viking Center outside of Ribe, Denmark, so the commentary is in Danish, but the pictures tell the story very well. I was impressed by the skill of both the clay worker who built the kiln and the glassworker who was making beads. No one knows for sure what a real Viking Age bead furnace looks like, so this is just one of many types that have been made.